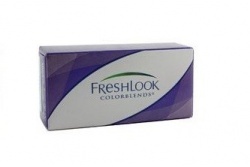 Freshlook contact lenses are designed for those people who look for highlight the color of their eyes in a natural way. They will give a different appearance to your look. All of them are available with and without prescription, so their main function is not to correct the usual visual problems but also gives an aesthetical effect. It is possible thanks to its “3 in 1”effect which offer to our iris a bigger depth and definition in its new color. Alcon use as the main material for these contact lenses Phemfilcon A, which helps to the prevention of protein hosts.